ATLARGE stands for the ATLantic city Annual Rec.Gambling Excursion. We are a diverse group of people with a common hobby: Poker! We've been gathering once each year in the springtime in Atlantic City since 1995. We dine, we drink, we laugh and we play poker, including LOTS of ring games plus three tournaments that we organize ourselves. 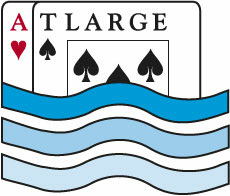 This year, ATLARGE2019 will take place at The Borgata, the largest poker room in Atlantic City. Our three tournaments will be April 26, 27 and 28. ATLARGE is the New Jersey version of http://www.barge.org (our group's biggest event, our annual gathering in Las Vegas in August). Roughly 200 people attend BARGE each year, and about 100 attend ATLARGE each year. Registration for ATLARGE 2019 is now open. You can also review existing registrations. The first ATLARGE2019 tournament will be on Friday, April 26, 2019, at 11:00am. The event is styled on Mike Sexton's original Tournament of Champions event from years ago at the Orleans in Las Vegas. It is a rotation tournament consisting of Limit Stud High, Limit Omaha-8, and Limit Hold'em. After the 12th level, the tournament becomes no limit Hold'em until the end. The second ATLARGE2019 tournament will be on Saturday, April 27, 2019, at 11:00am. 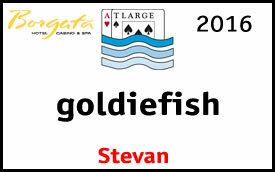 Ths event, which is the centerpiece of ATLARGE, is No Limit Hold'em. The third and final ATLARGE2019 tournament will be on Sunday, April 28, 2019, at 11:00am. This event will be Pot Limit Omaha with a lammer add-on, unless Goldie changes his mind. The structure sheets for these tournaments are available here (only not yet). Because we begin on Friday morning (11am) many of us gather on Thursday night for a group dinner. The best way to know where the dinner will take place is by subscribing to the ATLARGE mailing list (link below). The dinner is “Dutch Treat” meaning each person is responsible for what they eat and drink, including tips. We refer to this dinner as the “annual non-smoker” because we used to smoke cigars either before or after the dinner. Don’t worry if you’re not a smoker; there will be no smoking in and around the dinner itself. After dinner some of us will look for a cigar friendly place to relax. BE SURE TO SUBSCRIBE TO THE ATLARGE EMAIL LIST (bottom of this page) for ongoing information posted by our members about who’s going where, who has a car, etc. The buy-in for each of our tournaments is $100+$20+$10 (Prize Pool + House Rake + Dealer Toke Pool). Note that as a matter of policy The Borgata withholds 3% of the Prize Pool for dealer tokes but our group prides itself on being generous to the dealers so we take an additional $10 from each player at registration time to enhance the dealer tokes. Buy-in for each event will be at The Borgata. Players will pay their $120 to the Borgata and an ATLARGE volunteer will be at the registration line to collect the added $10 from each player. The FIRM DEADLINE for registration is noon Eastern time on Monday, April 22, 2019. If you haven't registred by then AND PAID YOUR REGISTRATION FEE you will NOT be registered for ATLARGE2019. How Can You Participate in ATLARGE? EVERYONE IS WELCOME! But because we all originally met over the Internet, the only rule for participation in any of our events is that you must register over the Internet. Since you're reading this, you've already come to the right place! If you fill out the registration information below, you're in! Then, all you have to do is pay for the registration fee, and show up and have fun. Dinner on April 25 is self-organized by our members. The best way to know what's going on or to suggest a place where you'd like to have dinner, is by subscribing to the ATLARGE mailing list, below on this page. The Borgata will spread cash games at all limits, including an ARG favorite, the $7.50-$15.00 "pink chip" holdem game! (The Borgata will be adding an additional $5000 in pink chips this year to ensure that we are fully accommodated!!) Baby PL is also available, if there is sufficient interest. Airport to 30th Street — SEPTA. 30th Street to A.C. — NJ Transit. You are well advised to check the train schedules in advance, lest you be destined to repeat ADB Jester's overnight stay in 30th Street station at ATLARGE III, missing the Smoker. The Borgata has set aside a block of rooms for us; make reservations requesting the "tournament rate". The rates (plus applicable taxes and resort fees) are: $169 on Friday, $249 on Saturday, and $95 for all other nights. Please note that rooms are NOT unlimited. So, if you are a regular poker player at the Borgata and are already eligible for their poker rate, please make your reservation as you normally would, WITHOUT mentioning ATLARGE. This will help save our designated rooms for others. If you aren't already signed up for it, we recommend you join the ATLARGE mailing list by clicking here. In addition to the rec.gambling.poker newsgroup, lots of us trade insults on this list. Oh, and we also keep informed about ATLARGE type stuff here too. Late registration details will also be announced there. To attend our events and play in our tournaments, everyone must register and pay the ATLARGE REGISTRATION FEE of $25. For your $25 you'll get a special gift and memento. Registrants are also entitled to book a room at the Borgata from a block that has been set aside for us at their discounted poker rate. The $25 registration fee must be paid in advance. Before each ATLARGE tournament, each player will pay $120 to the Borgata and $10 to the ATLARGE dealer toke pool, both of which will be collected when registering for our tournaments. The registration deadline is noon Eastern time on Monday, April 22, 2019. If you have not registered and paid your $25 registration fee by that Monday before ATLARGE, you will NOT be able to attend. Please be guided accordingly. Payment of your registration fee must made by check. No PayPal and no credit cards of any kind will be accepted. Your registration is complete upon your registration above and Goldie's receipt of your check. Remember, your payment must be received no later than Monday, April 22, 2019.